Admittedly, we’re a little crazy about prizes. Our own Vilcek Prizes are bestowed annually upon iconic immigrant artists and brilliant foreign-born scientists. Even when we examined prizes not devoted to immigrants, however, foreign-born scientists still made a strong showing across the board. 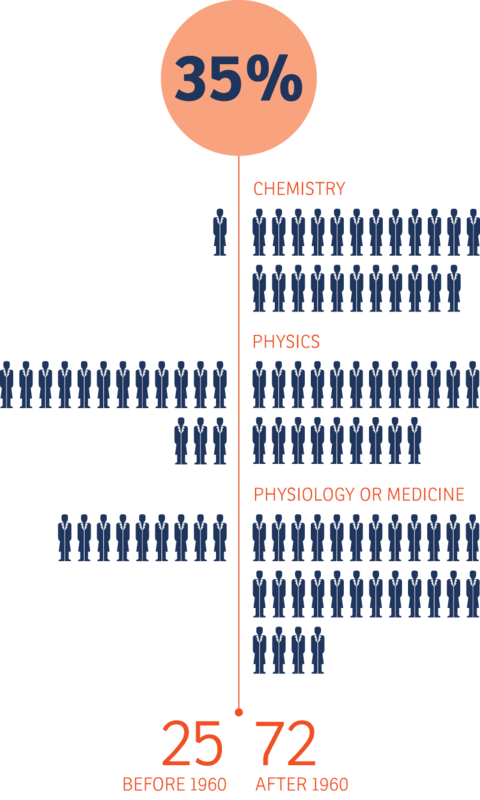 In this second installment of “Immigrant Nation, American Success,” we look at how immigrants elevate the caliber of scientific study in the U.S., as demonstrated by the high percentage of foreign-born recipients of awards and fellowships in STEM (science, technology, engineering, and mathematics) fields. Consider, for example, that of the 277 Nobel Prizes awarded to scientists working in the U.S. from 1901 to 2014, 35% of those scientists were foreign-born. However, this wasn’t always the case: Almost 75% of those Nobel Prizes were only awarded after the Immigration and Nationality Act was passed in 1965, which eliminated discriminatory national origin quotas and increased employment-based green cards. 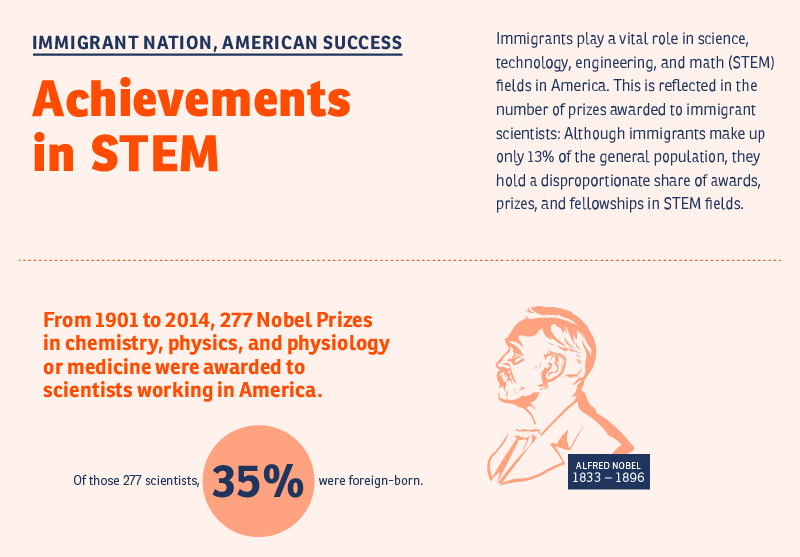 In “PhDs and Patents,” our first infographic in the "Immigrant Nation, American Success" series, we look at the link between foreign-born researchers and innovation. The foreign-born population has been increasing as a percentage of the total population since the 1970s. Currently, immigrants make up 13% of the total U.S. population. Read more and download the infographic!